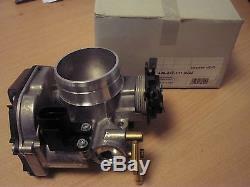 Brand new genuine VDO Electronic Throttle Body part number 408-237-111-002Z as fitted to. Seat Cordoba 2.0i 1993-99 AGG engine. VW Corrado 2.0i 1993-95 ADY engine. VW Golf III 2.0i 1991-97 AGG , ADY , AKR engines. VW Passat 2.0i 1990-96 ADY & AGG engines. VW Vento 2.0i 1991-98 ADY , AGG & AKR engines. The VAG part number is 037133064. VDO make this part originally for VW so this is a Genuine new part not an inferior copy or a remanufactured part. Check the part number on your original unit to be sure its correct for you. If in doubt send me your chassis number and we'll see if we can match it up. The item "Brand New Genuine throttle body 408237111002Z 037133064 VW Corrado Golf Passat" is in sale since Thursday, April 13, 2017. This item is in the category "Vehicle Parts & Accessories\Car Parts\Electrical Components\ECUs/Computers". The seller is "camcoelectronics" and is located in Warrington, Cheshire.